Planning a company or private party is always fun but organising it takes careful consideration, from hiring the venue to ensuring everyone has a great time and that they all get get there and back safely. Whether it be friends or company employees you want everyone to enjoy themselves while at the same time making sure that everything goes well and you have thought of everything. Visit us here to see some of the fun parties people have on our party buses. Hiring a party bus could be your answer to everything – from providing a successful and fun venue with food, refreshment, lights and ambience – to ensuring the safe arrival and return for your guests all for just a few dollars per person. Not only that, it’s a great way to get your party started as everyone feels a part of the festivities even before the real partying begins. There are so many uses for a party bus. From sporting events, birthdays, anniversaries, hen and stag nights, pub crawls, school balls, kids parties or any kind of celebration, you can rest assured that your guests will have the best time and with an experienced licensed chauffeur to transport you and your guests to any venue on time and safelyy you have no worries at all! If you want luxury, style, comfort and absolute fun all rolled into one – come and experience the Ultimate Party Bus! It’s the largest limo coach in Auckland and the minute you and your guests step on board this fun filled coach – you can’t stop smiling. With pumping music, perfect lighting to create mood and atmosphere and lots more, it offers the ultimate venue for your next event. Some party buses also have storage areas where you can secure your bags or personal items. It all depends on your needs for the day or night so make your list and hire one of many action packed fun-filled party buses to get you there and back. It makes sense and it save cents. No concerns about pay parking or drink driving, the penalties for which could cost you so much more than the few dollars you might need to pay to board your party bus of choice. It also makes sense to take the stress out of driving yourself. Everyone enjoys being chauffeured around without a care in the world, it is just such a fun thing to do! If an all night party on wheels is what you want for your guests you can do so in luxury and comfort. Party-goers will enjoy the great atmosphere from the minute they board the party bus until they are ready to be delivered safely back home. It’s such a load off your mind not having to worry about cutting the night short. You and your guests can rock on for as long as you like and nobody has to worry about getting home – or bothersome neighbours complaining about you having a good time! 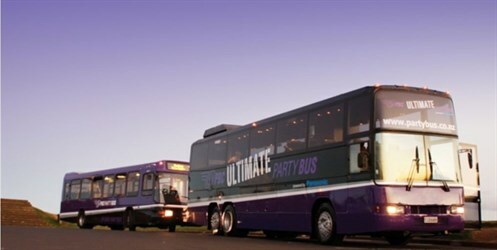 It doesn’t matter what size group you have, there are party buses to suit both small and large groups. Our party buses offer a range of different sizes to suit all occasions right up to our double-decker party bus that seats up to 75 guests. Enough for the entire company or a large group of friends and family. Whether you are looking to hire a venue for any sort of function from a Christmas party, corporate event, a company launch, family reunions, hens’ or stags’ nights, or a visit to a local vineyard, Markovina Vineyard Estate is hard to beat. The magic is in the planning and the detail and this group of talented people know what it takes to make it happen. Browse our site and see some of the great packages we offer and the fun and celebrations others have been having.